· The winner of the game is the side that has built more territory, so let's try to take as much territory as we can. Of course, there's a knack for doing this, and throughout the game, until the issue is decided, we do our best to increase our territory and to reduce the opponent's. · Let's have a look at Dia. 7. Please count the x-marked territory surrounded by Black. There are 15 points, so this is a 15-point territory. The x-marked territory surrounded by White is 12 points. 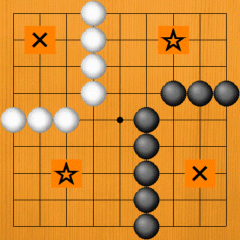 15-12 = 3, so Black has three more points than White. We've made the shape simple here, so that the territories are easy to count. The star-marked areas are still empty, so actually this game has not yet been finished. · Let's try moving the stones a little closer together. Please look at Dia. 8. Both sides have two territories. Black's A territory is 11 points. 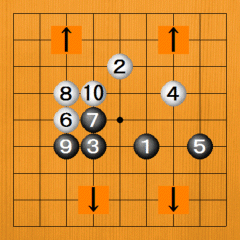 B is also Black's territory and it's 8 points. 11+8 = 19, so altogether Black has 19 points. 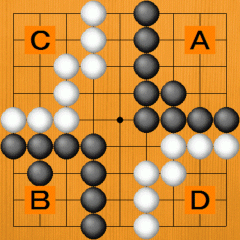 White's territories are C and D. First, C is ten points, and D is 8 points. 8 + 10 = 18, so White has 18 points of territory. 19-18 = 1, so Black has one point more than White. The result of the game is a one-point win for Black. · (Application) Let's compare the black and white territories in Dia. 9. Black's A territory is 10 points. B is 6 points, so the total is 16 points. White C is 8 points and D is 5 points, so the total for White is 13. If we subtract that from Black's total, we find that Black has 3 points more, so Black wins the game by 3 points. · (Game Example 1) Let's look at Dia. 10. 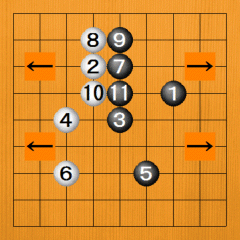 This shows the moves from 1 to 8 in an actual game. 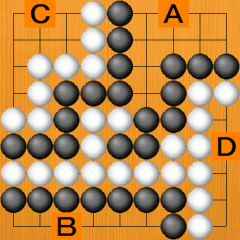 If you survey the whole board, you can see that Black has surrounded the area with the right-pointing arrows and that this area looks like becoming black territory. White has surrounded the area with the arrows pointing down and to the left, so this looks like becoming his territory. It's enough just to see this, without worrying about the finer points. · (Game Example 2) This is another actual game. It has proceeded to move 11. Again, Black looks like getting territory on the right side and White on the left. We hope you can see this. 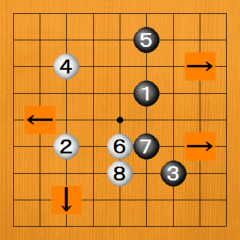 · (Game Example 3) The directions have changed in Dia. 12. Up to 9, Black has surrounded the bottom area and, with 2 to 10, White has surrounded the top. More or less imitating this way of playing is good enough. Imitation is the short cut to understanding Go.